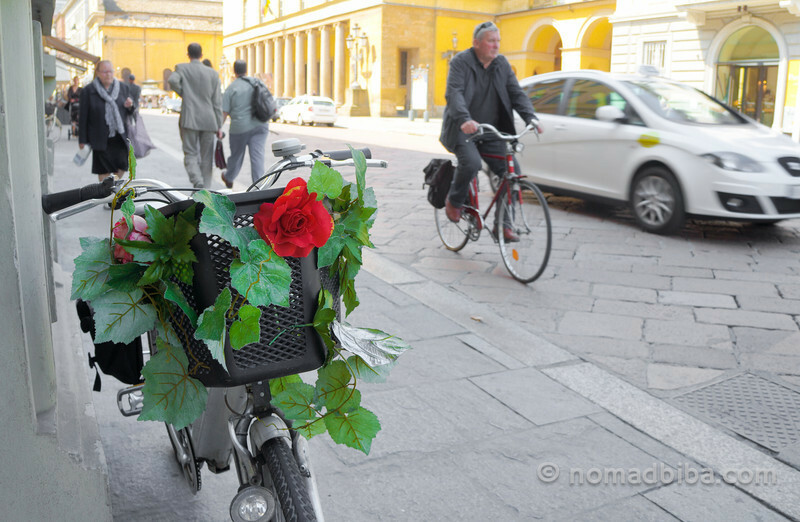 During my first visit to Parma, I was enchanted by how much its citizens love bikes; all over the city’s center bicycles roam freely and rule the streets. That’s my kind of place, definitely! I was very impressed to see all kinds of people cycling around: business people, families, young people, older people… No wonder they all look so happy and healthy! And when I saw how green and beautiful was the landscape that lies beyond the city, I knew I had to get myself on a bike ASAP and pedal my way around. 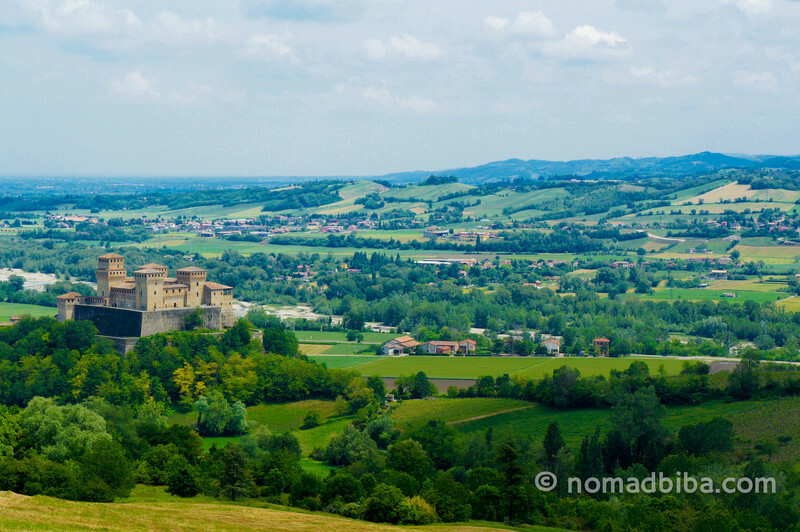 So after a bit of planning, a day trip was arranged by the amazing BlogVille team and in collaboration with the lovely Gemma Bonardi from LiberiSpazi to go cycling in the area surrounding the Castle of Torrechiara, located just 18 km away from Parma. By noon, we got to the village of Torrechiara, which lies below the castle and our bikes were already waiting for us, courtesy of A.S. Torrechiara. A few minutes later, we were on our way uphill towards the castle. It was just a short ride up a gentle hill, we wandered a bit around the castle before deciding to go inside. The Castello di Torrechiara was built between 1448 – 1460 by Pier Maria Rossi, Count of San Secondo di Parma, in honor to his lover, Bianca Pellegrini. 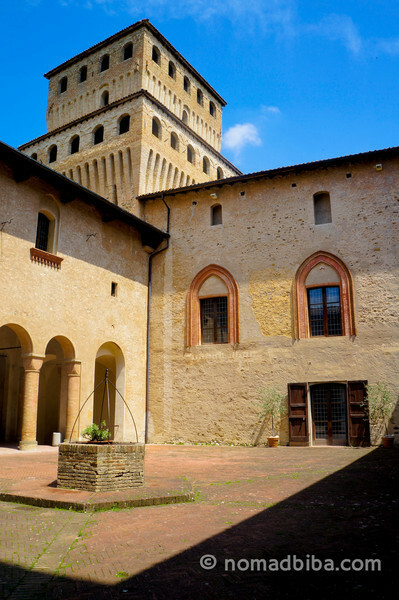 The castle is the most visited in Parma since it’s very well-preserved and it combines medieval elements with those of the Italian Renaissance. 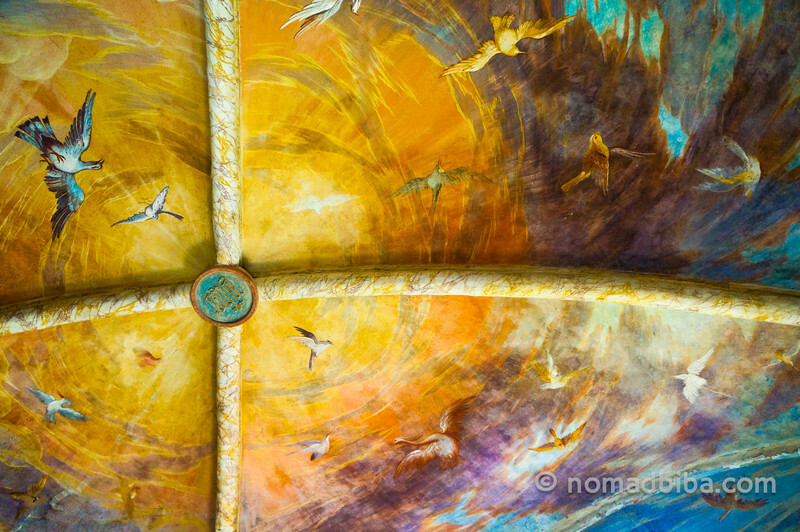 Inside, the rooms are decorated with “grotesque” frescoes, alluding to ancient works that are found in grottoes as oppose to ugly or distorted figures. 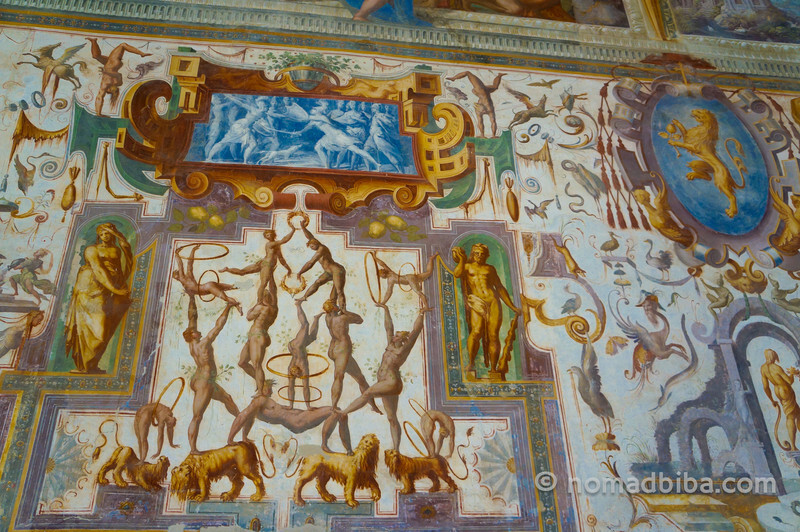 Also, as it was the custom in those times, each room is named after its most important decoration: Sala di Giove (Jupiter), del Pergolato (Arbour), degli Angeli (Angels), Salone degli Acrobati (Acrobats’ Room, details in the photo below), etc. In my opinion, some of the most beautiful work was on the ceilings of some rooms where they had painted many different types of birds flying in the sky; my favorite is the one below, depicting a scene at sunset. It is just breathtaking! 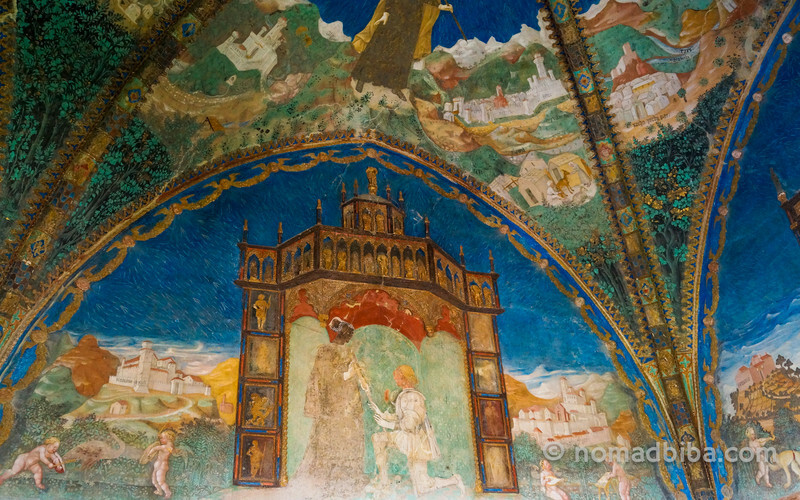 However, the most famous room in the castle is the Camera d’Oro (the golden room), which was Pier Maria Rossi’s bedroom. The walls in this room are covered with frescoes alluding to the great love between the Count and his lover, Bianca Pellegrini. Pier Maria Rossi was sent to Milan to study and when he was just t 15 years old he was forced to marry Antonia Torelli to unite their two families and avoid conflicts between them. However, while he was in Milan he fell madly in love with Bianca Pellegrini, a court lady of the Duchess Visconti. After several years of marriage and having 10 children with Pier Maria, Antonia Torelli retired to a convent; leaving the way free for him to get together with Bianca Pellegrini and build for her a couple of castles. In the picture below, Pier Maria gives Bianca his sword as a sign of complete submission. 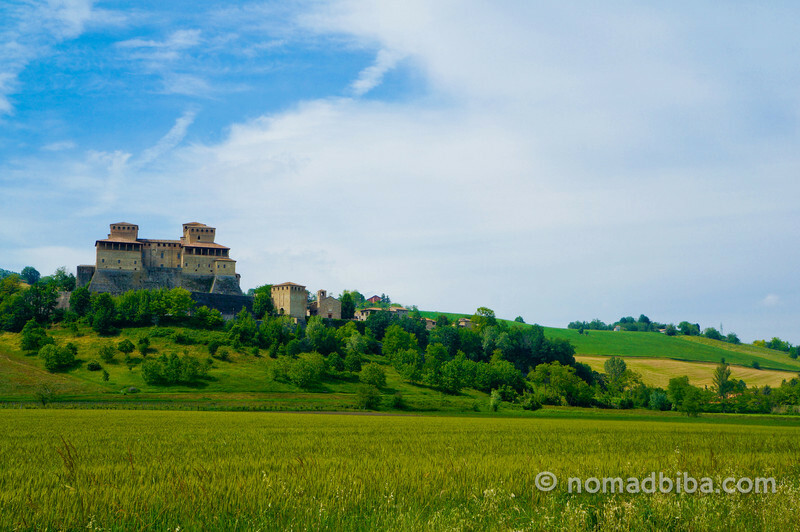 After visiting the castle, we continued to cycle on the roads around it and I got a chance to photograph the Castello di Torrechiara from a lot of angles! It was a great afternoon and I am grateful I had the opportunity to mix my passion for biking with a visit to this very impressive site. This day trip was part of my experience at BlogVille, an initiative from the Emilia-Romagna Tourism Board to bring bloggers to explore their region and showcase what they have to offer. If you are planning to visit Italy, you should have a look at the stories compiled by all the bloggers to get some nice ideas for your trip.